The Young Millionaires program is offered Island wide by five regional service agencies, and has operated since 1991. The program teaches basic business skills to youth ages eight to 16 and helps them start a business of their own over the summer months. They develop basic business skills such as record keeping, customer service, public speaking, and life skills. Participants attend workshops on marketing, customer service, accounting and basic business planning. Participants submit a business plan that outlines their business, ideas, goals and a request for funding of up to $150 towards start-up costs. “This year, more than 200 students enrolled in the program across the Island, and they started 145 new businesses,” says Karen Duffy, Coordinator of the program. From left: Tanner and Nicolas Ansems, sons of Chantale and Barry Ansems, Whim Road. 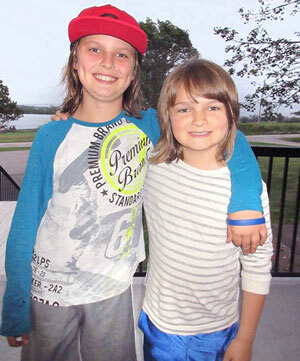 Tanner Ansems is 11 years old and in grade six and his brother Nicolas is nine years old and is in grade four. They both attend French Immersion at Montague Consolidated School. Their business is called Secret Treats. They plan to continue making and selling their products because of the popularity of their sales. From left: Ella Burke, from Bay Fortune, is the daughter of Barbie Lavers and Carl Burke. Taylor Gallant, from Eglington, is the daughter of Tracie and Mark Gallant. 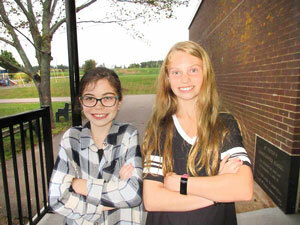 Ella Burke, 10, and Taylor Gallant, 11, attend Souris Regional School. They are best friends and opened a summer business called The Garden Girls. “I was so excited when I heard about the Young Millionaires Program at school,” says Ella. “Taylor and I convinced our moms we could run our own business. “I decided to paint lady bug rocks and make garden mushrooms and sun catchers from repurposed glass vases and bowls. I staged the booth with flowers and driftwood to attract customers. My lady bug rocks were definitely the most popular. Ella plans to become a veterinarian, caring for animals. Taylor plans to become an animal advocate and own and operate an animal shelter. The program was hosted by the Rural Action Centre in Montague. Visit www.ruralactioncentres.ca. For more information about the Young Millionaires Program, visit www.youngmillionairesprogram.ca. Funded through ACOA and Innovation PEI and sponsored by the Rural Action Centre. STAR (Start To Apply Right) and SEAM (Skills Enhancement And Mentoring) youth program participants with Coordinators Chris Shaw and Jenna MacDonald, and Team Leads Natasha Rayner and John Gaudet. As a result of discussions held during the program, youth identified careers they want to explore further, such as Welding, Mechanics, Arts/Broadway, Music, LPN/Nursing, Special Needs Educator, Military service, and Video Game Designer. Two youth programs held in a total of six locations across the Island this summer have proven to be of great value to the participants and the community. 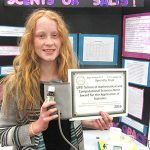 The STAR and SEAM programs were held in West Prince (Alberton and Westisle Composite High School) as well as in Summerside, Charlottetown, St. Peters, and Morell. Both programs helped support high school students in grades 10, 11 and 12 who are returning to high school by offering career direction and encouragement to make successful life choices. “These programs are a win/win for everyone involved,” says Chris Shaw, Alberton Coordinator. “Along with getting paid for seven weeks, the youth learned a lot of skills which will help them in the future. Also, the community got to see the youth being very productive and helpful. They did things for the communities that were long overdue. “Community members couldn’t believe the great services we were offering, such as weeding gardens, picking up litter, and odd jobs for the second hand clothing store and the food bank,” says Chris. One youth participant talked about a gentleman who was so thankful to get some help cleaning up the site of a non-profit organization. Another youth talked about cleaning windows for a business owner who said she hadn’t seen through the windows in a long time. “She was so pleased with our work, she offered to provide a letter of reference for us,” says the youth. The programs also worked on building skills in areas such as financial literacy, and discussed information on careers of interest and the steps to take to get into those careers. There were a lot of moving parts to these summer programs that had a ripple effect. “The youth couldn’t say enough about how much they learned, and how they enjoyed and felt supported and a part of the program,” says Jenna MacDonald, Westisle Coordinator. 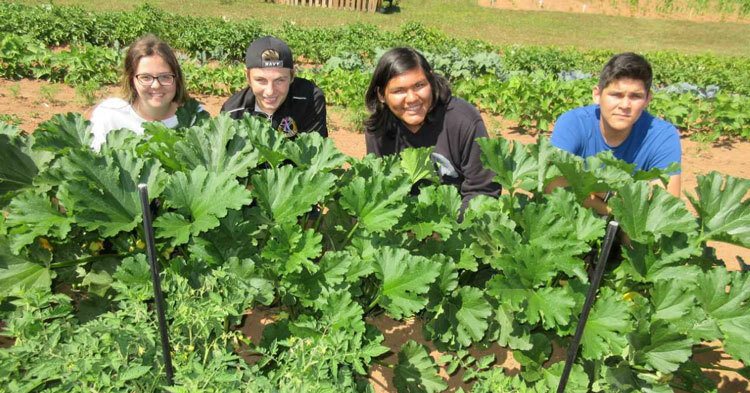 The Westisle SEAM program tackled a garden project called “Good Food, Good Health.” The goal was to grow veggies to donate to the Westisle Composite High School cafeteria in September. Guest speakers such as the RCMP and others came in to discuss their fields of work, and there were many discussions on job search, communication skills, and dealing with anxiety. They also did personality assessments to get to know themselves better, to learn how to manage conflicts, and to discover what careers best suit each personality. Carla Boswall, Summerside Coordinator for the SEAM program, says the programs are a place to help youth build self-confidence, develop job-ready skills, and offer many other supports around managing life challenges. John Gaudet, Star program Team Lead, has a music and business background. “I took the business program at Holland College in Alberton and was referred to this job by one of my college learning managers. “This is work I have never done before – working with youth and mentoring in a teaching setting. I wanted the opportunity to build my skills, and I have always wanted to do more in my life that makes a difference. Tyler Harris, Seam program Team Lead, came from a low-income family and is now in his fourth year university. For the article about the youth program in Morell, click here. Funded in part through the Government of Canada Career Focus program in collaboration with the Government of Prince Edward Island, and sponsored through the West Prince Chamber of Commerce, Mi’kmaq Confederacy of Prince Edward Island, East Prince Youth Development Centre, the Community of St. Peter’s Bay, and The Adventure Group. The STAR program and the SEAM programs were held in West Prince (Alberton and at the Westisle Composite High School) and as well as in Summerside, Charlottetown, St. Peters, and Morell. from left: Madelyn O’Hanley, Carson Myers, Noel Paul, and Isaac Paul participated in the Good Food Good Health garden project. The Good Food, Good Health garden project held in Morell recently celebrated participants’ achievements under warm and sunny skies. About 25 people attend the event, including the four youth who were in the program and their families, government officials, Morell High School administrators, Chief Brian Francis of Abegweit First Nation, and other supporters of the project. The four young participants gave garden tours that showcased rows of healthy food they planted, grew and maintained under the volunteered direction of Stephen Cousins, an organic farmer from the area. “Gardening was one part of the project,” says John Jamieson, Deputy Minister, Agriculture and Fisheries. “The youth developed the confidence and life skills they need to make good decisions. The youth participants and the Project Coordinator spoke about the experience of being part of the program. I had the privilege of coordinating this program over the summer. It was a great joy to work with the students. In the beginning, I don’t think any of us guessed how well we’d get along and work together. As we learned more about each other’s personalities, backgrounds, cultures, skills, and interests, we realized how different we all are. Our differences were the magic ingredient contributing to the success of this program. Each person was willing to offer their strengths to help the group grow and also to ask for help when they were struggling. Working in this garden has taught us all to trust. We planted seeds and tended them. Day after day, we watered, weeded, trimmed, replanted, and watered some more. As the weeks passed, little sprouts began to shoot through the soil, and grew into the garden we see today. Our friendships grew as well. Throughout the summer, we saw a lot of PEI and learned about different aspects of farming, health and wellness, and financial literacy, to name a few. We visited farms, greenhouses, and gardens, and spoke to people in those professions. We also visited the Westisle SEAM group toured parts of western PEI. We also camped at Wood Islands, which was a highlight of the summer. We hiked through Greenwich, played tourist in Charlottetown, spoke to vendors at farmers’ markets, learned about wigwam building in Fort Amherst, and toured UPEI. This garden started as the seed of an idea with Mr. Reid, the physical education teacher at Morell High School, and the guys’ group he met with weekly during the school year. Today we can see how his idea has literally taken bloom. We are excited to be part of starting something so much bigger than ourselves that hopefully will inspire other schools to do what we’ve done here. I am a grade 10 student at Morell High School. This group helped me gain confidence when talking to strangers, and it helped me figure out what steps I need to take to improve my education and try to become a pro soccer player. At UPEI, I was told that if I ever changed my mind about going pro, another good career would be to become a physiotherapist, which also sparks some interest for me. The group has helped me improve my time and money management. I was able to save most of my pay in a savings account. I got closer with the others in the group, although in school we never said a word to each other. But now we talk every day and we connect. This was a very successful group. Other people should get the chance to experience it! I am starting grade 11 at Morell High School this September. Our group started in early July as strangers. In the first few days, we were shy, didn’t talk much, and focused mostly on work or the friends we already had. As days passed, we became more comfortable with each other. When we all went on a camping trip, we joked with each other and laughed together as we swam at the beach and created lasting memories. Being part of this experience was one of the best decisions I made in my life. I became friends with people I thought I would never be friends with. This was one memorable summer. I’m going into grade 12 at Morell High School. I was one of the first people in the guys’ group that Mr. Reid and Mr. Judson started. It started as a chance to meet and talk once a week, but some of us had a hard time talking, so we decided to form a garden group. It’s been cool to see it turn into a summer job. Over the course of the summer, I had to go to summer school in the mornings and missed some of the activities. With school being my priority, I learned a lot about balancing responsibilities. I helped the group in the garden as much as I could in the afternoons. It was usually pretty hot and hard work, but I learned a lot. It’s cool to be part of starting something like this on PEI. I will be going into grade 11 at Morell High School, and I live on the Morell Reserve. Early this summer I made some goals for myself. One of my biggest goals was to learn how to bake, and it was great to make cookies and cinnamon rolls. My next goal is to work on my social skills, because I am not very good at talking to people. I am very scared of talking to strangers because I do not know how to make a good first impression. Over the summer, I went to farms, colleges, and campgrounds. I had the chance to talk to complete strangers during this time. I was nervous and scared, but now I feel less nervous but still scared. During this summer job, I got to learn how to garden, which I knew nothing about previously, so I was confused about why they picked me. I learned about watering, weeding, potato bugs, composting, and transplanting. I am grateful that I got to learn these skills because they are extremely useful on PEI. Funded in part through the Government of Canada Career Focus program in collaboration with the provincially gGovernment of Prince Edward Island, and sponsored through the West Prince Chamber of Commerce, Mi’kmaq Confederacy of Prince Edward Island, East Prince Youth Development Centre, the Community of St. Peter’s Bay, and The Adventure Group. Guy Albert, Program Manager, The Learning Partnership, checks out students’ video game projects. In May, students from West Kent, Elliot River, and Stratford Elementary schools showcased video games they developed in their classrooms. Classmates, educators and the public were welcomed to explore the students’ interactive exhibits and speak with them about their innovative video games. The students learned coding skills through a program funded by the PEI Department of Economic Development and Tourism. Coding Quest is Canada’s largest classroom-based coding program. This year, more than 38,000 students in grades 4, 5, and 6 from across this country participated. Developed by The Learning Partnership, the program is available for free to public school students, challenging them to apply critical thinking, creativity, problem-solving, as well as Science, Technology, Engineering and Math (STEM) skills to design and build their own computer games. “On PEI, 18 schools participated,” says Guy Albert, Program Manager of The Learning Partnership. “In September 2016, we trained 34 PEI teachers to help students learn computing and programming skills. This program is integrated into the curriculum though subjects such as science, language arts, social studies, and other areas. “This time last year, we were just starting the process of integrating coding into our school system,” says Doug Currie, Minister of Education, Early Learning and Culture. “The teachers who were trained to teach this skill were hugely successful. We will continue to build on this success in other schools. We will continue to teach coding skills, which improve students’ ability to solve problems and think critically and analytically. “Introducing coding skills is one of the biggest curriculum changes I have seen in my lifetime,” says Heath MacDonald, Minister of Economic Development and Tourism. “Coding skills are extremely important for the next generations moving forward into the future. There are many positions available right now for computer program developers with IT companies. It is one of the hardest positions to fill. These are well-paying jobs, and the demand is only going to increase. The students combined their interest in a certain subject with the fun of building a video game. One student made a math concept more understandable by using an x/y axis to aim a soccer ball into a net. Another student explored the best treatment for a concussion, including sunglasses for light sensitivity and healthy food as a way to recover. A grade 5 student from West Kent Elementary school made a game which teaches users about the respiratory system. After information is presented, the player answers a list of questions. When the correct answer is chosen, the character’s costume changes. He says he chose the respiratory system because it was a game he could upgrade, and it was fun to do. From information he found on Wikipedia, he put together information on the respiratory system, and also wrote the questions and answers for the quiz. This school project is not the first game this student has developed. He started by experimenting with different code to see what would work, and sometimes asked people if he got stuck. He has 50 published projects so far. Why is it important for young children to learn coding skills? As Canada’s workforce evolves and becomes increasingly digitalized, the skillsets needed to compete in a global economy are evolving as well. Close to 90 percent of jobs now require basic information, communications and technology (ICT) skills, yet there’s a chronic shortage of skills in the Canadian tech sector. One study predicts that Canada will be short 180,000 ICT workers by 2019. Coding is increasingly viewed as the next language for the next generation of workers. As schools begin integrating coding into their curriculum, here are three ways to spark your child’s interest in programming. Encourage exploration. Give your child enough room to play and explore on their own. The process of discovery is a core component of a coder’s world. Encourage your child to experiment with different tools to find one that ties into their interests. It’s as much about the journey as the outcome. Foster creativity. Programming is as much about being creative as using STEM skills. Programmers like to solve common problems or address previously unfulfilled gaps. Encourage students to be curious. Push them to learn how things work and find creative solutions to problems. The Learning Partnership is a national charity dedicated to building partnerships to support, promote and advance publicly funded education in Canada. Since 1993, more than 6.5 million students have participated in The Learning Partnership programs. For more information, visit www.thelearningpartnership.ca. The IB (International Baccalaureate) biology class at Charlottetown Rural High School is helping fellow students explore Science, Technology, Engineering and Math (STEM) careers through a new website. IB biology class students, from left, Clair Auld, Tristan Atkins and Asia MacMillan. This project is one of 11 national finalists in Samsung’s Solve For Tomorrow contest. To find that information, students investigated sources such as Service Canada, Statistics Canada, Holland College, and UPEI. The website also features brain games meant to spark interest in those careers. “We want to instill a greater interest in youth about science careers,” says Patricia Shields, IB Teacher Advisor. As a finalist, the school will be given new technology worth $20,000. The top two winners get $50,000 and will be featured in a video with YouTube stars Mitch Moffitt and Greg Brown of AsapScience. 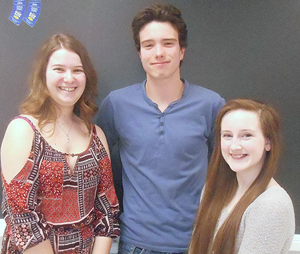 Grade 11 IB students Tristan Atkins, Asia MacMillan and Clair Auld were impressed by their class’s research. What am I good at and what do I care about? What high school courses allow me to explore my interests? What kinds of jobs or occupations interest me? What courses and community learning experiences will help me reach my goals? What is my action plan? myBlueprint is the easiest way to plan your education and career. Click for related articles about kindergarten to grade 12. Click to watch adult education videos. Click for related articles on adult education. Click for related articles on literacy. Click for related articles to Workplace Essential Skills.